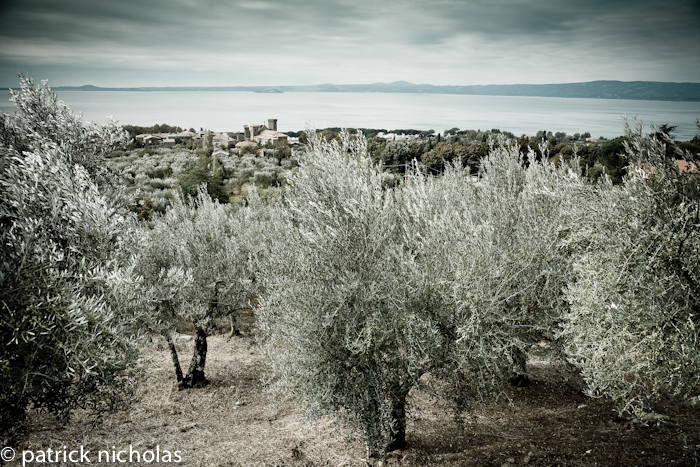 The olive hasn’t much to do with photography other than that olive groves end up being in a lot of landscapes. However, olive oil is one of the good things of Italy that most people appreciate while here. The hilly countryside around Orvieto and Lake Bolsena is chequered with olive groves and vineyards. 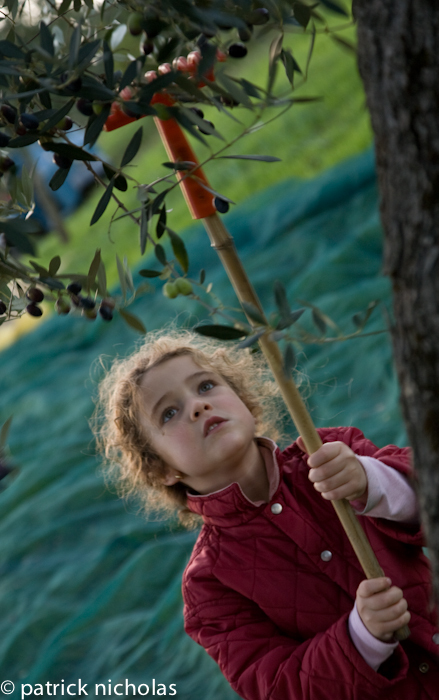 The well drained volcanic slopes are perfect for both, but of the two, olives are the easiest to cultivate as an olive grove requires little maintenance just the three ‘Ps’: pruning, picking and phertilising. And then comes the marketing, and there lies the rub. The European Union is almost criminally lax when it comes to how olive oil can be described on the label of a bottle. Sadly one can almost ignore the (mis)nomen of Extra Virgin, much better to look for DOP on Italian oil which stands for Denominazione d’origine protetta which ensures the oil comes from a specific area and therefore not blended. 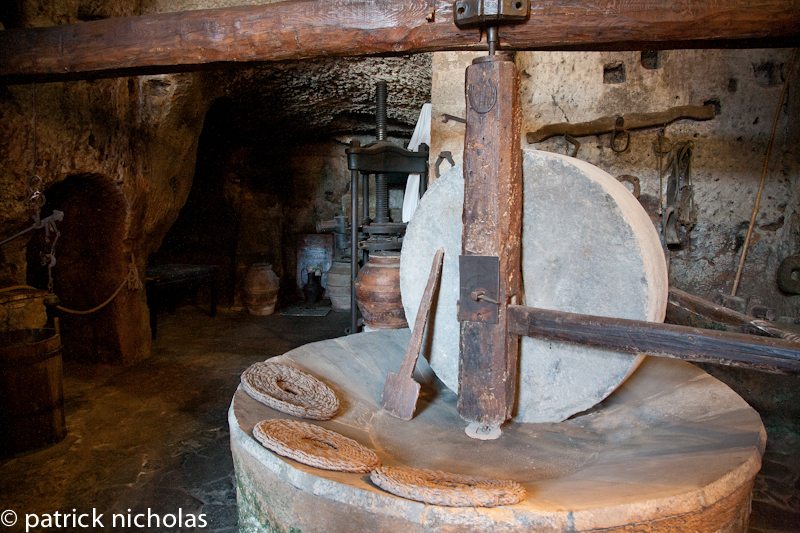 Donkey-powered olive press in Civita di Bagnoregio. This is now a hosteria where you can eat a bruschetta with local oil and sip Umbrian wine in a delightfully cool and dry ancient grotto. In 2008 there was a huge scandal in the Tuscan wine business involving the world famous Brunello which comes from Montalcino, just down the road from Orvieto. It transpired that some of the most expensive bottles had been adulterated with second rate Merlot after a particularly difficult summer. 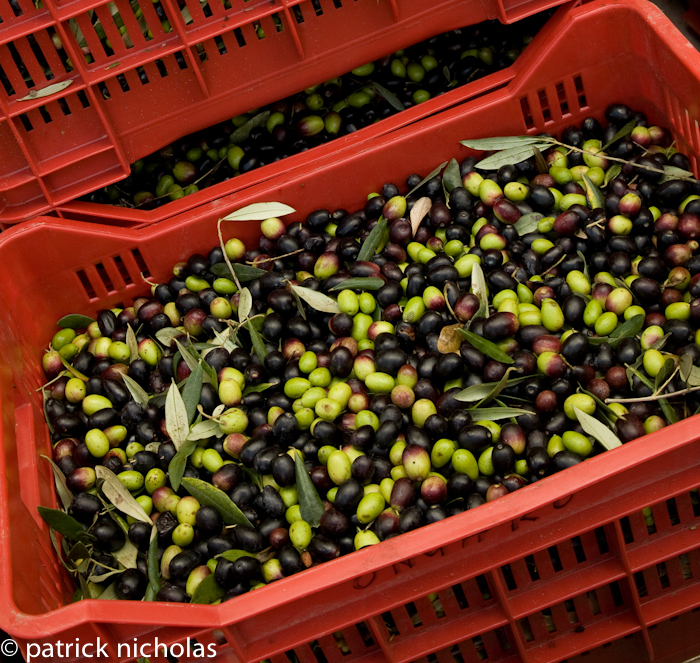 The lesson for the consumer is the same as that for olive oil – distrust the big boys. In the Brunello scandal it was the big producers that blended with inferior wine because they had huge orders to complete and a vast industry to maintain – the temptation was there and they took it. The small producer just sells less in a lean year. The Sunday Times magazine recently ran an article about olive oil in which they published a table of best to worst. Incredibly, one of the best was Tesco Supermarket’s own brand with 4 stars from Puglia at £7 (500ml), whereas Harrods’ Spanish oil El Verd del Poig at a whopping £70 (500ml) gained a measly one star – a loud hurrah for the common man!